Hi friends How can I add gadgets in windows 7 as I am a new user of this windows am not getting about adding the gadgets other then which are packed in windows os. Re: How can I add gadgets other then those comes with windows 7? Also there is many sites that provide Gadgets all to be installed in a similar way.Just Google it!!! You can add many gadgets to the windows 7 other than those come with the OS and it is very much easy and just you need to have an internet connection with your computer so that you can download your gadgets to the windows7 and make your system to look very affective to you.and also some of them make your system to improve the performance of it. STEP 1: Right Click on any area on the Desktop and Select "Gadgets". STEP 2: Double Click on the Selected Gadget to add it to the Desktop. For more Information, you can Click on the "Shoe Details" Button. STEP 3: Close the Gadget Gallery Window. Right Click on the Gadget and Select "Close Gadget". Click on the "X" Mark on the Top Right Corner of the Gadget. Another Way to add Gadgets is through Control Panel. To know that.. CLICK HERE. 1. Right-click an empty place on the desktop and choose Gadgets from the pop-up menu that appears. 2. In the Gadgets window, scroll to look through the built-in gadgets. 3.Toadd one to your desktop, simply drag it onto your desktop. Click the Get More Gadgets Online link, and you’re transported to the Windows 7 Personalize Your PC page, which lists Gadgets galore. go onl9 microsoft .com . there is many gadgets for window 7. what u want to download . go on pc screen . right click by mouse on screen . than it will open a list choose this word "gadgets". when gadgets box will open there is option it provid u " get more gadgets onl9". click on it n it will reach u microsoft . com. there u can choose ur fovrte gadget what u wannt . to install new gadgets download a gadgets and install it. now go to gadgets by clicking Right-click on desktop--> select gadgets. gadgets. you can get it direct in Windows 7 or Windows 8. 4. There you will se a option "Get more gatgets online"
5. So download it from there and implement that. So enjoy more Gadgets functionality. All the best. To install new gadgets download new gadgets and install it. Go to gadgets by clicking Right-click on desktop--> select gadgets. But make sure that your windows OS copy is not pirated but genuine. artifacts. can get directs in Windows 7 or Windows 8. 4. There you can an option " gets more |gatgets| on line"
5. So it flows those of there and the instrument that. So it enjoies more |funcionalidad| of artifacts. Good luck. Firstly, Right-click on Windows Desktop and choose Gadgets. Now, double click on the gadget you like to be on your desktop. Hence, gadget will be placed in your desktop. But if you want to have more gadgets, then you can download it from internet. Click on "Get more gadgets online". Here, you will have to select gadgets and download it. Then Select it to Display on the Screen. 2. Click on any gadget that you want to run on your desktop. 3.The gadgets will appear at the right side of your desktop. Clearing your desktop will not minimize the gadgets – they are always open unless you close them. 4.Once downloaded, open the file to run the installer. 6.You should see it appear on your desktop. Gadgets are cool thing on the desktop, they make desktop beautiful and helps for ease access. There are lots of gadgets available online for different uses. 2) Here you will find some important gadgets. 2) Select Gadgets from that menu. 3) In gadgets click on Get more gadgets online. -->Go to Microsoft.com web site. -->Their you will see more number software's. -->then you can download which ever you want. -->Then after that install it on your PC. -->After that if you don't want means you can reinstall. I think this is the most easiest thing. 2. Go to gadgets section. 3. then choose one of your favorite gadget in many of them. 4. Download now and installed in your PC. 5. Then go to Desktop, Make a right click and choose gadgets from them. 6. There you got the installed gadget which you can throw it on the screen. 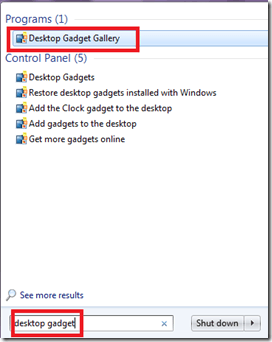 Adding more gadgets in windows 7 operating is very easy! 6:After installing those gadgets you will be able to use those on your desktop! Now your new gadgets will be placed with the already installed gadgets! 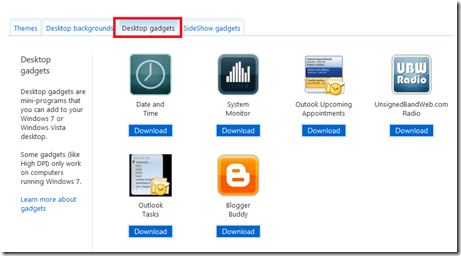 Go to Start menu ..
And Click on gadget gallery..
Download Gadgets from micro soft blog and add into Gadget gallery.. Which Gadget you want drag on Desktop that gadget..
Now you can use that Gadget..
1.Firstly you need a internet or LAN connection to your computer. 2.Then you go to the 'Google'. 3.There you type 'Gadgets for Windows'. 4.Now go to any site from that list of sites. 5.From there you can Download those gadgets. 6.These gadgets are of very small size. 7.So you need not require much space. 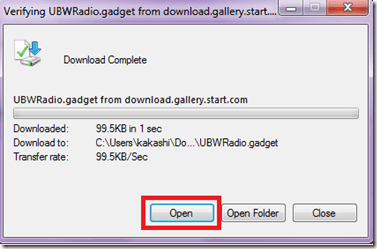 8.After downloading install them in your PC. You possibly have enough idea about gadgets and more gadgets, but i`ll suggest one simple thing to you. They eats resources (Memory, Storage). They attract Malware and spyware. The make the system cluttered. Install the most important and utility gadgets only. It looks good if you maintain any gadgets on your desktop. It is too easy to add gadgets on the desktop. Just right click on the desktop and select gadgets. Choose the gadgets as per you wish. Select the choosen one and double click on it. Then it will be applied to your desktop. after that close the gadgets window. Yeah! you can get the more gadgets then the Windows 7 provide you. 1.You download the gadget which you like from internet. 2.You can download it by going to :http://www.thoosje.com/Windows-7-gadgets-gallery.html:. 3.Then you download the gadget which you like. 4.Then you extract the files and install it. 5.Then you can use that gadget. 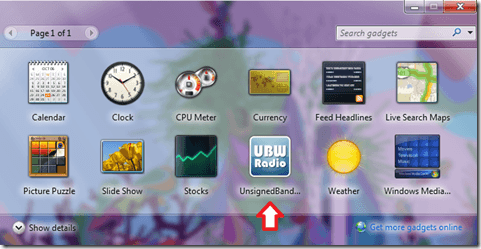 You can download new gadgets for window7 and install them. 2. it will open one gadgets window in downright corner u have option called download more gadgets online from there u can get more gadgets ..
3. after downloading just open file that u had download and it will ask for install click on install and u have added new gadget .. like that u can add numbers of gadgets ..
D. There you will se a option "Get more gatgets online"
E. So download it from there and implement that. Now you will find a option "GET MORE GADGET ONLINE"
there are many websites are available by which you can download window7 gadgets and also can install them.some website link are i given you..
> and just right click on desktop and choose "Gadgets"
2. To add one to your desktop, simply drag it onto your desktop. 4. When you’re done adding gadgets, click the Close (X) button to close your Web browser and then click X to close the gadget chooser. - now click on option "get more gadgets online "
Then the gadget will be added to the desktop.